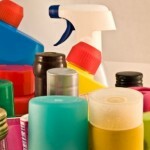 Chemicals In Household Cleaning Products – How Toxic Is My Cleaner? How Toxic Is My Cleaner? It’s not easy to figure out how toxic your household cleaners are however there are a few tools available that might be able to help you figure out if you really want to purchase those products. Sometimes ingredients are listed on the labels, other times their not. Tapping into the Consumer Product Information Database (CPID) is a good way to find out what’s in your household cleaning products. When you search on a household cleaning product and the database finds it, it will list the damaging effects to your health. The CPID is unique because it links brand names to health effects and allows consumers to select brands based on their individual sensitivity to specific chemical ingredients. You can search by Brand, Product Type, Ingredients, Manufacturers, Health Effects, MSDS (Material Safety Data Sheets) and First Aid. Another site you might find useful is the State of New Jersey Right to Know Program. At this website you can type in a chemical’s name and if found, it will bring up a Hazardous Substance Fact Sheet that will tell you more about the chemical, and the hazards of using it. If you spend some time on these sites you will be able to determine what brands are less toxic than others, and armed with this information you should be able to purchase products that are safer for your home and family. Just how harmful are these chemicals? Very! Here is just a brief description of how harmful these products can be to you and your family. Whenever possible, consider an alternative that is safe. Laundry detergents contain chemicals that can cause a number of problems including rashes, itches, allergies and sinus problems. The residue left on your clothes and bed sheets is absorbed through your skin, as is everything else you touch. Disinfectants attack the liver, kidneys, spleen, pancreas, and the central nervous system and it takes over a year to eliminate the unhealthy effects of spraying 2 ounces, even with heavy cross ventilation. Oven cleaners are one of the most toxic products people use. They contain lye and ammonia, which eats the skin, and the fumes linger and affect the respiratory system. Not to mention the residue that is burns off the next time you turn on your oven. One of my customers recently told me they were astonished at the number of harmful chemicals listed on a basic household cleaner. She was thrilled that Sunrise Cleaning uses Thieves® Household Cleaner; because it left her house smelling clean and fresh and she knows that her child and pets are safe. What information did you learn from the CPID? Previous post: Why Green Your Cleaning Products?